There’s a new kind of business intelligence tool in town: visual data discovery. 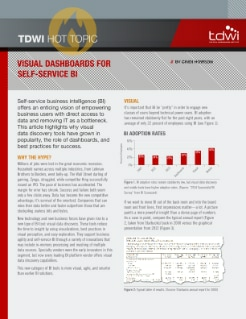 It’s more visual, agile and smarter than traditional BI solutions. With it, companies mine their data better and outgun their competitors. How to use visualizations to reduce the time to insight. The role of dashboards for easy exploration. Best practices in visual perception. How to improve performance with in-memory processing.